Specific Research Market Trend of Lubricant Oil Industry 2014-2020 (Growth Trends & Market Share) was released in the first week of July 2018 containing independent research displays, comprehensive data, latest analysis and market reviews, as well as market volume growth trends and lubricating oil market share in general as well as lubricants specific automotive segment (cars and motorcycles) in Indonesia. The discussions were conducted in detail from the overall market trend of general lubricants (general market), domestic production and sales trends, to more in-depth analysis of motor oil lubricant market, to motor oil players market share. Specific Research Market Trend of Lubricant Oil Industry 2014-2020 (Growth Trends & Market Share) is the latest update of previous specific research plus projections up to 2020. This specific research begins with the exposure of Indonesia’s macroeconomic data, inflation, and the rupiah exchange rate (page 2 and 3). Highlights of economic growth and automotive industry growth are presented on page 4. Followed by 2018 business outlook and prospects referring to government economic growth targets in 2018 on page 5. And followed by a review of macroeconomic growth, automotive sales, and global lubricant sales on page 6 . On page 7 and 8, the market trend analysis of lubricant oil market conditions in Indonesia from Duniaindustri.com team survey resulted from 2017 to first semester of 2018. Followed by the latest acquisition plan that will happen in the lubricant industry in Indonesia on pages 9 to 11. Going into the core study, on pages 12 to 14 describe the market size trends of lubricant oil in Indonesia, divided into local sales as well as import volume & oil mix period 2014-2020. The data are then analyzed in detail on pages 14 and 15. Then the data is reinforced by the market share of the lubricant industry (overall market) in the period 2011 to the first half of 2018 on pages 16 to 22. The track record of the lubricant oil business competition competition in Indonesia is described in detail on pages 23 to 26. Followed by a discussion of the composition/portion of the automotive oil segment and the industrial oil segment to the total market value on pages 27 to 29. The lubricant oil composition data per segment is then -breakdown to withdraw its growth trend and analyzed on pages 29 to 35. 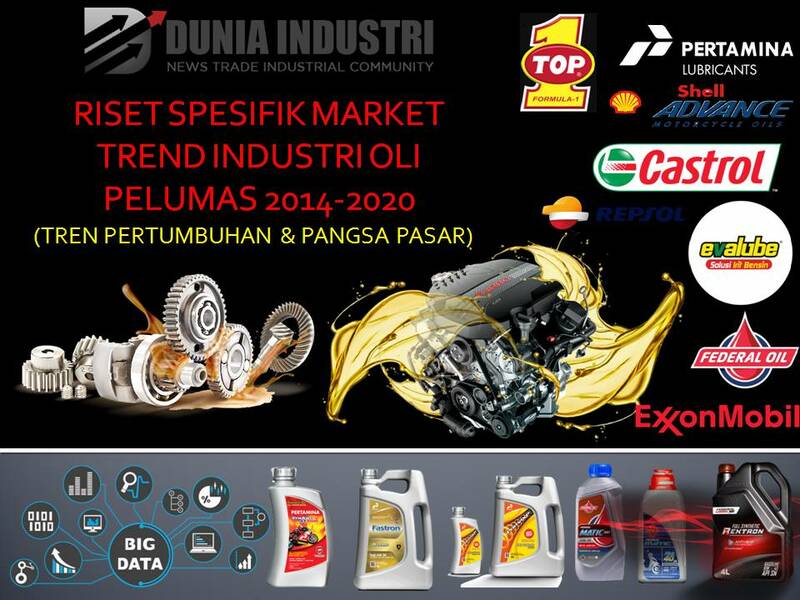 On pages 36 to 38, the market trend of motor oil lubricant growth in the period of 2017 to the first semester of 2018, along with market analysis and survey results of Duniaindustri.com team. Followed by a discussion of market intelligence results containing exposure to sales performance, production, and market share of the two market leaders of lubricant oil industry, plus business strategy and forward targets on pages 39 to 56.